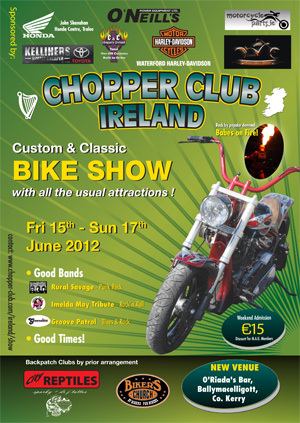 The 2012 Chopper Club Ireland Custom & Classic Bike Show takes place at O’Riada’s Bar (alongside the main N21 road, between Castleisland and Tralee) running from Friday 15th to Sunday 17th June. No less than seven bands! Hope to see you all, Respect Chopper Club Ireland. We wish both the Iron Horsemen MCC and the No Rules MCC all the best with their shows the same weekend.